Topics: Projects, Electrical Services, Telecommunication Services, and Thermographic Studies. 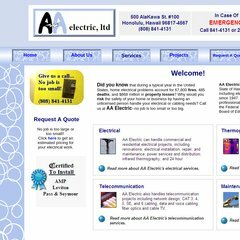 Aaelectrichawaii.com's IP address is 85.13.200.108. Its 2 nameservers are ns1.itahost.com, and ns2.itahost.com. It is hosted by Coreix Limited - Dedicated Server Ip Allocations (England, London,) using Apache web server. PING www. (85.13.200.108) 56(84) bytes of data. A time of 97.7 ms, is recorded in a ping test.